Hiro Hattori, undercover Shinobi assassin, and Father Mateo, Portuguese priest stationed in feudal Japan, are on a mission. Their cover story is that the foreign priest has heard of sacred Mount Kōya and wishes to see it but in fact, Hiro, cousin Hattori Hazzō, leader of the Iga ninja, has been sent to Mount Kōya to deliver a message to another Iga ninja assigned to guard a temple on the mountain. Because of an approaching storm, it’s easy for the “pilgrims” to seek shelter at the temple. Though the priests are at first wary of having a foreign priest—“What kind of pilgrimage takes a priest of the foreign god to Kōya’s summit?”—they can’t turn aside someone requesting sanctuary during a storm. Hiro makes contact with Ringa and his message is delivered: That Hattori-sama’s deadly enemy, Oda Nobunaga, has attacked the Iga ryu, an attack in which the woman Hiro loved was killed, and Ringa, assigned to the temple as its warrior-priest, is to warn his agents along the coastal travel road. Ringa will never carry out his assignment; during the night, he is murdered. Immediately it becomes evident the priests, in spite of their intentions to the contrary, still retain a good many earthly flaws. There is argument over who will care for the body. Ringa’s disciple claims that right. One of his pupils does also. The abbot orders an investigation. A conversation between the abbot, Hiro, and Father Mateo makes them conclude that Ringa was killed by another priest. Hiro’s examinations haven’t progressed very far when another death occurs, this one also violent. The abbot himself is killed. Now Hiro recognizes a pattern. Both Ringa and the abbot’s bodies are arranged in the position of two of the thirteen statues of Buddha. Accusations as well as motives abound among the priests. Several expected to be the one succeeding the abbot upon his death and each puts forth the reasons he should be chosen. They are a varied lot, a former samurai, an orphan believed to be a reincarnation of a bodhisattva, a physician, a cook—and there are the guests, given storm-sanctuary, a man and his small son, three women from the nunnery further down the mountain. Though females are forbidden within the temple itself, they are given shelter after the nunnery is struck by lightning and burns down. Father Mateo is also suspect because he’s a foreign priest and several of the Shingons show their prejudice against foreigners. Hiro will have to find the killer before any more people die. If it is a priest, as he believes, it may one driven not by ambition or the selfish desire to be abbot, but by some holy obsession since the bodies are posed as the Buddha statues. It is then he realizes the surviving priests, including Father Mateo are in danger . . . 11 men, and there are still 11 statues of Buddha left. Author Spann has endeavored to be as accurate as possible in her descriptions of the customs, clothing, and architecture of this particular time period, and it shows in the dialogue and actions of the characters. For those not familiar with the religious practices of the Asian countries—and that probably includes most readers—the descriptions of the funeral rites of the Shingon practice will be of particular fascination. Indeed, the very detailed explanations of religion is truly informative while not being presented in a pedantic way. Hiro’s investigative techniques, on the other hand, appear quite up-to-date and not 16th century at all. 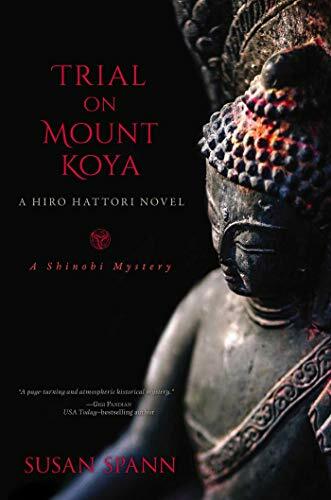 In Trial on Mount Kōya those who have read Claws of the Cat or any other Hiro and Father Mateo novel will again be reminded what a pleasure these novels are and will enjoy becoming reacquainted with these two characters.